Growing concerns about a possible nuclear war and other global threats have pushed forward the symbolic Doomsday Clock by 30 seconds - to just two minutes before midnight. The Bulletin of the Atomic Scientists (BAS) said it had acted because the world was becoming "more dangerous". The clock, created by the journal in 1947, is a metaphor for how close mankind is to destroying the Earth. It is now the closest to the apocalypse it has been since 1953. That was the year when the US and the Soviet Union tested hydrogen bombs. Last year, the clock was also moved forward by 30 seconds. What was behind the decision? Announcing the move in Washington DC on Thursday, the BAS said the decision "wasn't easy" and said it was not based on a single factor. However, BAS President and CEO Rachel Bronson said that "in this year's discussions, nuclear issues took centre stage once again". The team of scientists singled out a series of nuclear tests by North Korea. They dramatically escalated tensions on the Korean peninsula and led to a war of words between North Korea and the US. The BAS also referred to a new US nuclear strategy that was expected to call for more funding to expand the role of the country's nuclear arsenal. Rising tension between Russia and the West was also a contributing factor. The "weakening of institutions" around the world in dealing with major global threats - including climate change - was another major concern, the scientists said. They also mentioned US President Donald Trump's "unpredictability", pointing to his often controversial tweets and statements. The minute hand on the Doomsday Clock is a metaphor for how vulnerable to catastrophe the world is deemed to be. 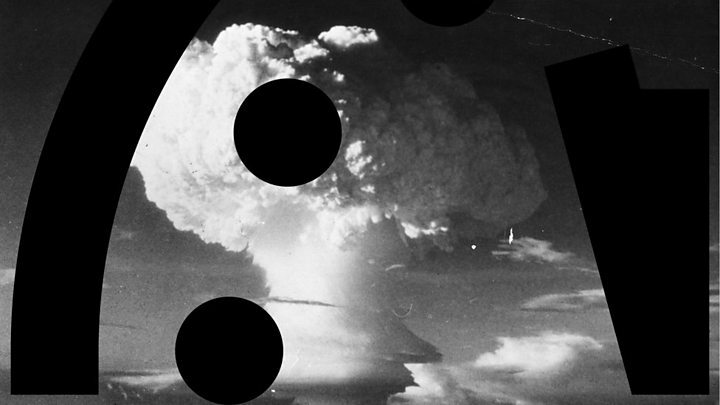 Media captionWATCH: Here's how the Doomsday Clock changed from 1947 up to last year. The symbolic device was created by the Bulletin of the Atomic Scientists in 1947. It was founded at the University of Chicago in 1945 by a group of scientists who helped develop the first atomic weapons. Today, the group includes physicists and environmental scientists from around the world, who decide whether to adjust the clock in consultation with the group's Board of Sponsors - which includes Nobel laureates. How does the threat compare to previous years? When it was created in 1947, the clock's hand stood at seven minutes to midnight. 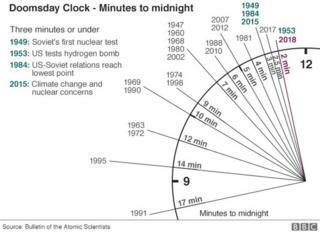 Since then it has changed more than 20 times, ranging from two minutes to midnight to 17 minutes before midnight in 1991. But during the 1962 Cuban Missile Crisis - considered by many analysts to be the closest the Cold War face-off between the US and the USSR came to escalating into a nuclear war - the Doomsday Clock stood still at seven minutes to midnight. The BAS says: "The answers to this seeming anomaly are that the Doomsday Clock captures trends and takes into account the capacity of leaders and societies to respond to crises with reasoned actions to prevent nuclear holocaust. "The Cuban Missile Crisis, for all its potential and ultimate destruction, only lasted a few weeks; however, the lessons were quickly apparent when the United States and the Soviet Union installed the first hotline between the two capitals to improve communications, and, of course, negotiated the 1963 test ban treaty, ending all atmospheric nuclear testing." In fact, the Doomsday Clock was moved back to 12 minutes to midnight in 1963.